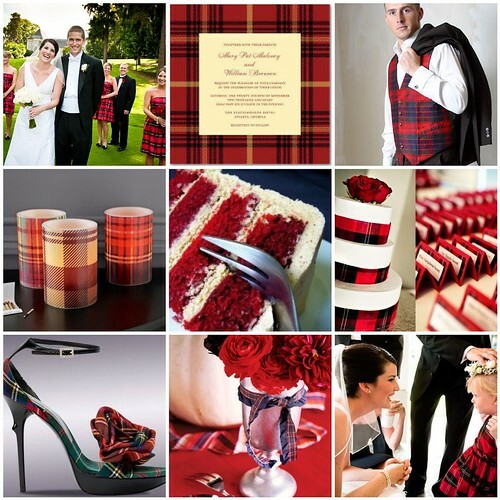 I completely forgot about the Tartans! However thanks to a reader's comment, I am now readjusting everyone's clothes in the sequel's draft. Once again, I'm just laying out ideas here as I usually refer to my blog musings for inspiration and also as a mockup for settings. 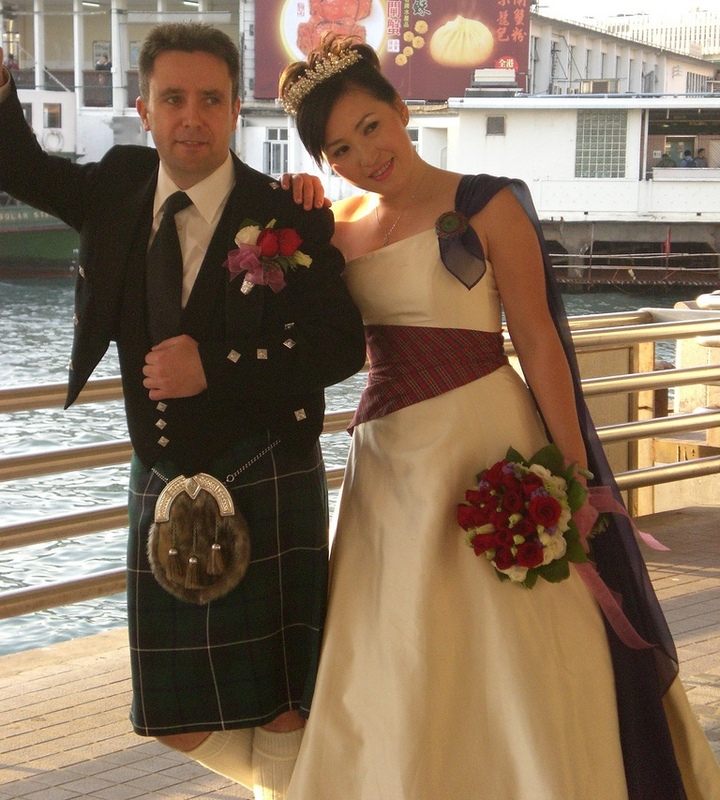 The woman reminded me of Cho Chang from Harry Potter and she's Scottish too! This is the "Dress Tartan" meant for formal occasions that is of a white background with blue and red over stripes. So it will look something like the groom in this picture. And I thought this picture was really cute! I can imagine all the MacFarlane men: Dominic, Mike and Eian fussing with each other like this. Now, isn't this more representative of their age group? -sigh- I'm having a headache again. Hahaha. Oh wait, I found a fantastic website!!!!! 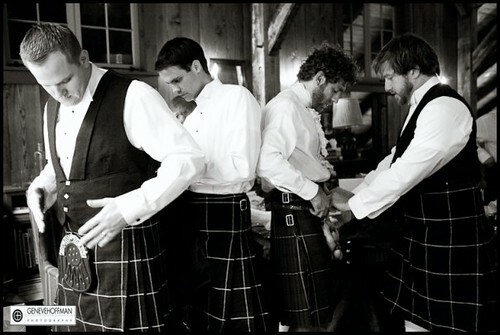 The groomsmen look like they're just wearing tartan bow ties and cummerbunds but don't the ladies look sweet? And that little girl too? Okay... seriously information overload. 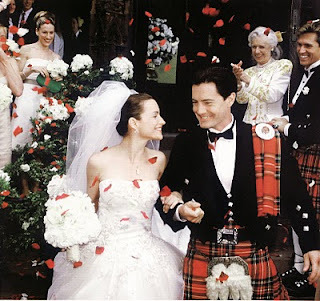 I'm caught between wanting a fairytale wedding [less tartans] or a truly royal scottish kinda feel. So I did the next thing on my mind- I checked out the Duke of Argyll and holy crap I found this! His Grace's TitleThe most high, potent and noble prince his Grace Torquhil Ian Campbell, Duke of Argyll, Marquess of Kintyre and Lorne, Earl of Argyll, Campbell and Cowal, Viscount Lochawe and Glenyla, Lord Campbell, Lorne, Kintyre, Inveraray, Mull, Morven and Tyrie in the peerage of Scotland, Baron Sundbridge of Coombank and Baron Hamilton of Hameldon in the peerage of Great Britain, Duke of Argyll in the peerage of the United Kingdom, Baronet of Nova Scotia, Hereditary Master of the Royal Household in Scotland, hereditary keeper of the royal castles of Dunoon, Carrick, Dunstaffnage and Tarbet, Admiral of the Western coasts and isles, and Chief of the Honourable Clan Campbell, MacCailein Mhor. Right, that's a mouthful. Okay Duke of Argyll, you're officially the model template for Eian. OOOO FREAK me! Your research paid off! I think you blew my head off with the pic of the guys getting ready - "fussing with each other" - wow! I definately can see Keiran dressed much like the Duke of Argyle - sceptre and all! This is going to be one spectacular wedding! I can't wait!